A friend who was on the lace weekend just sent me a couple of photos of me! Now I hate photos of me ...but these were good soooh you get to see them! This is a great photo of me spouting about the beauty and versatility of tatting to anyone who would listen! 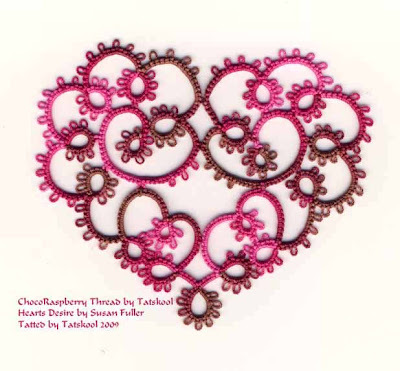 Some of my hand dyed thread hearts..you can spot ChocoRaspberry in there. Some geckos from Jane Eboralls pattern and a circle of rainbow butterflies made long before Rainbow Bright, a shuttle brothers butterfly and more! 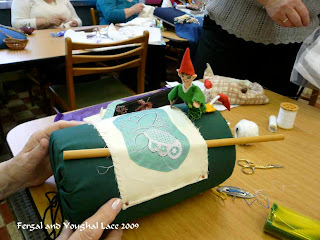 We were told to take one item to talk about...and I took my Blue Lagoon Cornelia Doiley one of my best pieces, plus as many other things as I could that would show my tatting world. The theme was butterflies so I had to wear my special Mother of pearl butterfly. necklace. 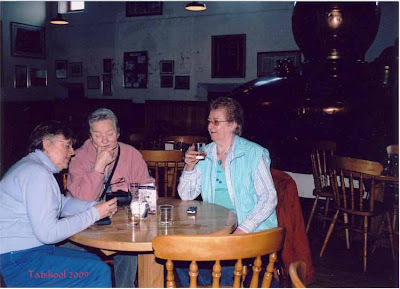 The second photo is of Jackie, Carmel and me(wearing my favourite colour..turquoise) at the distillery, testing the product...like you do! Back to the present.. I am working like stink on ChocoRaspberry and we just discovered that we have a nest of baby Starlings in our roof. Last night there was such a racket..guess they had just hatched, that it sounded like bevy of possums!! impossible of course. Mum has been busy all day taking insects and worms into them. I went up into my roof space but they were hidden...lots of straw and moss and twigs strewn everywhere tho. Hubby insists on waiting until they leave before we block the hole. 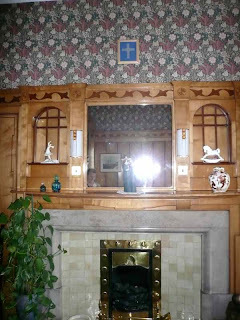 The hole is at the top corner of the dormer window in my bedroom..right above my bed!! Lets hope they sleep and don't wake too early. 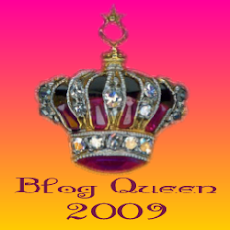 I published my blog yesterday and had so few visitors that I wondered why. 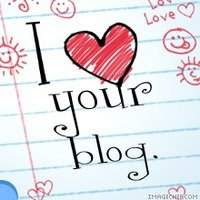 It wasn't showing up on anybody's blog roll.....mmmm...republished it again today and it still isn't showing...must be all that rain or maybe there is a fashion ban!!!!! maybe this will kickstart it. Back to tatting and dyeing sooooon. Got home last night after a wonderful weekend despite the weather. We left home in fog and rain and it rained almost constantly for 5 days! May used to be such a lovely month, one that I never got to enjoy..being stuck in an exam hall. I looked forward to this wedding for a whole year, to be able to go away in May...wonderful..but it might have been November..it was so cold and wet and windy. But the cottage that we stayed in was so warm and cosy and our son came down to stay with us,and we talked weddings....so we didn't mind the weather. 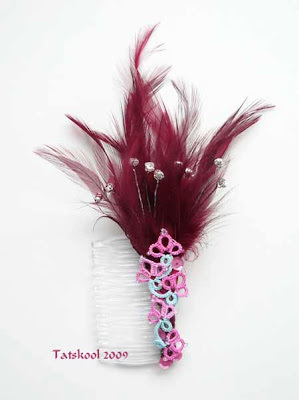 I know you are all dying to know how the outfit turned out....the fascinator was very simple...the feathers with the diamante came like that and I just attached it to a comb and added tatting. Not my best effort but OK, at least it matched. The outfit felt lovely, and isn't that all that matters. I loved the colour combination, which you can't really see in the photo. I showed all the combinations to my son and said IF I don't find anything else which do you prefer...and he liked this with the T-shirt!!! he would! He thought the patterned top and skirt were toooooo patterned but did admit that the top looked better on than on the hanger and much more formal. The tatting well..went mainly unremarked upon...but then wasn't that because it looked so professional!! The wedding venue had so many bits to it that every time we had to go from one part to another the heavens opened and it sheeted down. This was the first wedding I have been to where I actually got wet ..several times. Every time the photographer got his scenario set up..it rained. he tried to get all the guests....hanging out of an upper window...but he wasn't satisfied with the arrangement...and spent so long trying to get us right that it finally bucketed down and we all fled! The groom...my cousin's son who I had never met, plays double bass and bass guitar in a number of bands and he and his friends kept us well entertained. To compete with the atrocious weather,our sons car developed a problem and had to be taken away to a local garage.....very luckily we hadn't booked to come home on the early ferry so we were able to take him to the local station where there just happened to be a train within the hour..the only one that day that went without changing stations on a six hour journey to where he lives. How lucky was that in a bad situation! The sea was rough...but when we got off the ferry in Ireland the sky was blue and the sun was shinning...but it's raining again today. Forgot to tell you that the funniest thing of the weekend was when the owner of the cottage we stayed in came in and instantly remarked...oh you do tatting!...now how many times in my life has that happened. She learned to tat at age 13 too but now does crochet. I left her some butterflies to remind her of how it has changed. I guess I should show you the other part of my wedding outfits! Not often I have this much choice especially with a matching handbag. 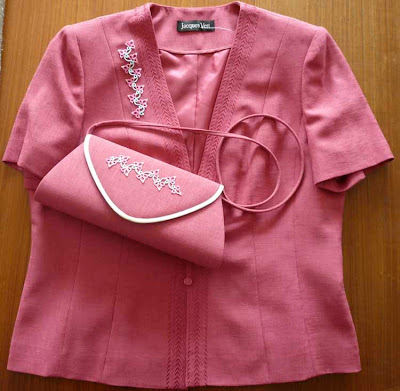 When the jacket is dressed up with different tatting it will look quite different. This is lovely with the jacket, a bit softer than the more formal plain skirt...that is gorgeous tho' with embroidery round the bottom to match the jacket. 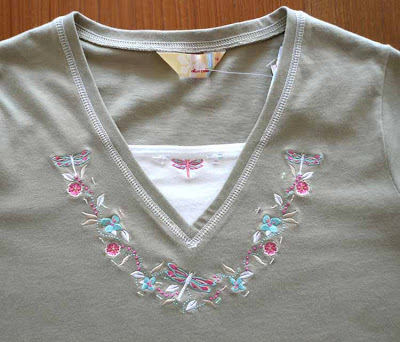 Worn with the patterned top and jacket it's very 'posh'! I finished the tatting and have to sew it on, made the fascinator but to be honest it isn't one of my better attempts! I seemed to have a mental block. 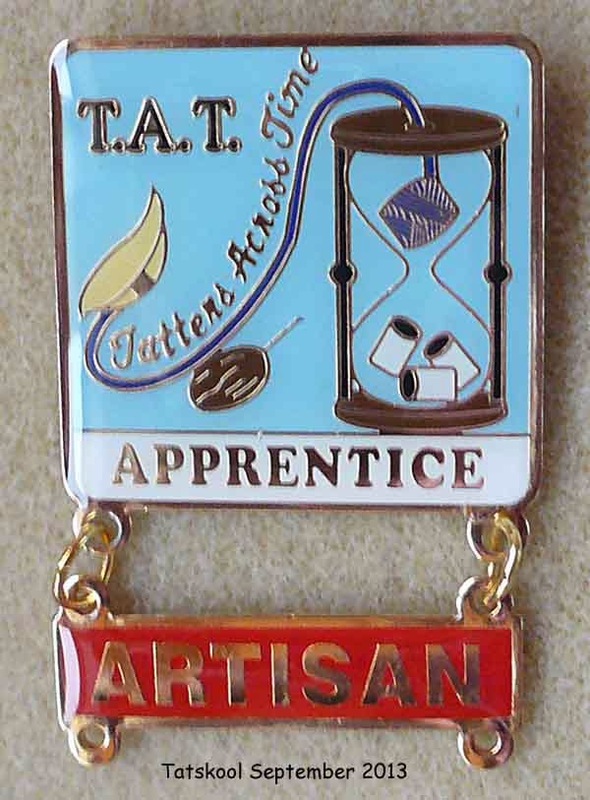 Busy, busy, busy...no time to dye more thread....apart from getting up at 6.20am most days this month to go and supervise exams...need to get up that early to be able to park my car!! Apart from that and my brain bursting with colour ideas...I am going to a wedding in Wales this weekend. 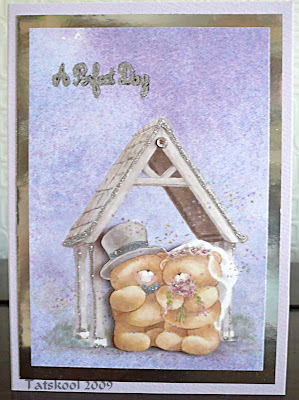 This is the card that I have made, wish you could see it sparkle. What to wear was going to be simple.. I hate having to buy 'posh' clothes under pressure, and so last July I got the most perfect outfit which grew into a 'capsule wardrobe'. 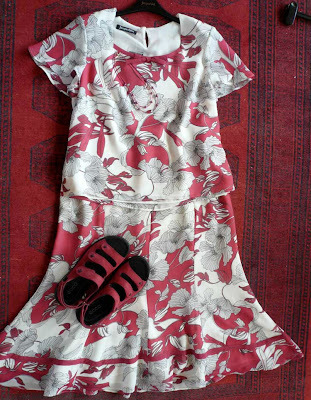 A patterned skirt and top...even found perfect matching sandals was joined by a toning jacket and plain colour flared skirt by the same manufacturer, a pretty white t-shirt for after it's done it's wedding duty, silver shoes and a matching shoulder/clutch bag. This was heaven to me, two weddings this year and a mix and match set. I did think that it would be perfect for the 'mother of the groom' but there was no sign of that...until now...my son is getting married next summer...so what do I do...save my lovely outfit in case I never find another without that awful pressure....or wear it now!! Then I had another look in my wardrobe and found yet another matching piece...a new 'posh' t-shirt in a sort of khaki green colour...sounds foul I know. 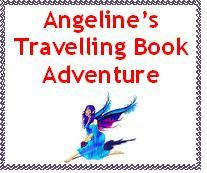 It is decorated with dragonflies in pink and robin's egg blue, and sequins and sparkle. The colour of suit is called Pomegranite...but when I got it out it shouted Raspberry to me!! (I wonder why!!) and the T-shirt looks lovely with it...mmm!....and so this is what I will wear on Saturday...the plain jacket and plain skirt with the T-shirt and shoulder bag. 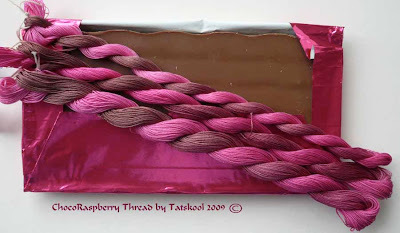 Well it just so happens that I have been dyeing a series of mix and match threads to go with ChocoRaspberry to make it more versatile, and one of these is called Raspberries and is just a play on the raspberry part of ChocoRaspberry. 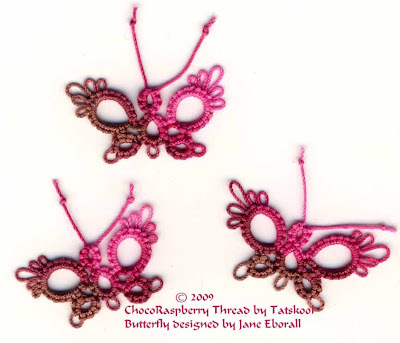 I tatted up Julie Patterson's bookmark pattern (that I have shown before) in my raspberry thread and flora blue..changed it a tad to add beads for sparkle and this is the result, it matched the T-shirt a treat. Everybody is always telling me that I should wear more tatting and show it off so here goes. This is as far as I have got. So hard to get the colours right. All I have to do now is to tat another length for the other side of the jacket and finish a simple fascinator for my hair. So what do you think..is a T-shirt posh enough for a wedding?? 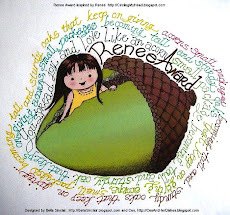 Isn't it the most wonderful thing when someone make something spectacular with something you have made! 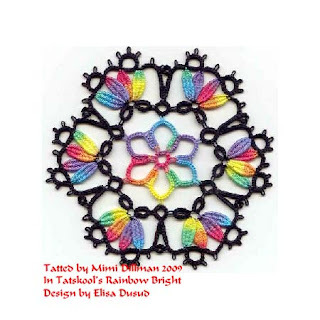 Well you have just got to see what Mimi Dillman made with Rainbow Bright. Woweee! what a difference the colour makes. It is amazing that she tatted this back in mid April at about the same time I guess as Yarnplayer tatted her Stained glass effect piece in black and her HDT Roses. Great minds are obviously thinking alike. I think the Rainbow Bright worked so well in this motif because of the short-ish color changes and the lovely bright colors that worked with the black to look very stained-glass rose-window-ish-y (how's that for a technical term??). The short color changes made it possible for 2 colors to show up in the leaves, and for each leaf to be different. I wish I could do those clunies, I would certainly be doing this one. I am very busy with my summer exam supervising but hope to show you my new threads soon. 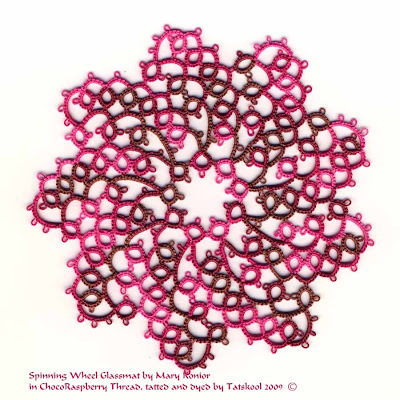 This is what I was tatting on the train and then untatting...not an easy task on a wobbly train with size 60 thread and a very new, very pointed sew mate shuttle. Split the thread and made a right mess of it. Ended up cutting off the ring and joining, a very rare occurrence. 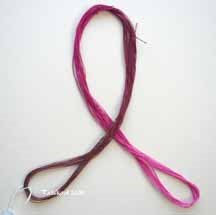 I have been dying to tat with Coral Reef again so I have been dyeing! Coral Reef is now back on my menu. This one is in size 60 like my last one in Blue Lagoon. I like the delicacy of it. This scan shows you the difference between the two threads. The funny thing is that when I first got the idea to dye Coral Reef the result was somewhere between the two. My friends said to make it darker and My Coral reef was the result...much more like what I intended....but I liked the lighter as well so made my dyes paler and a little bit different and Blue Lagoon was born and I love that too. 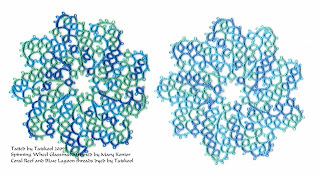 Anyone who hasn't been reading my tatting blog for very long might like to take a look at the history of my Coral Reef thread here. A long post but one that I particularly like. The post about my Blue Lagoon doiley is here. It's one of my all time favorite tatted pieces. Something new coming up soon as I have to get out of my rut! There were still more exciting things waiting for us. But before I start...my friend has given me a CD of all her photos...another 286 and she has some smashers. I hate photos of me but I guess you would all like to see a couple...Fergeal has already posted some on his blog...but here are a couple more. This is the queue for morning coffee and I am the one still working trying desperately to teach this lady the flip!! She tried from the train journey til we left for home and she still couldn't do it...but I don't give up!! 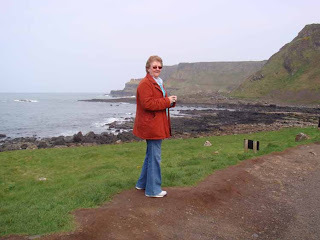 Second me picture is at the Giants causeway. 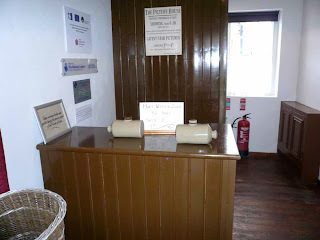 In afternoon on Sunday we were taken to the Ulster Folk Museum near Belfast. inside was a treasure trove of days gone by. 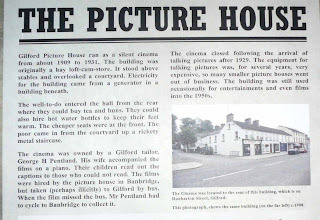 I liked the Picture house which was showing a Charlie Chaplin movie. It all looks pretty cold and spartan BUT you could hire a hot water jar for 2d to keep you warm...I like that. 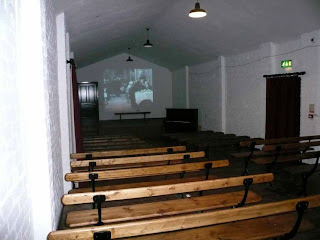 There was soooh much there,the school, church and all the tradesmen, the difference in living standards between the tradesman and the bank manager was phenomenal! I will have to stop !! But the weekend still wasn't over, there was one more treat to come. There was a special evening in the house, 5 course dinner and a musical evening called Music for an April Evening..Songs of the Musicals. After the diners had eaten their I am sure superb meal we joined them for the music and it was outstanding. A keyboard player who led the group,a cellist and jazz violinist accompanied four talented singers/performers. They were a joy to listen to. A delightful end to a special weekend. On Monday we came home, tatting away on the train. On the journey from Belfast to Dublin chugging slowly on an old commuter train as the express was not running....a lady ..our age and her daughter sat opposite. They were going to Dublin for the day and of course were fascinated by what we were doing. I didn't take much part in this conversation as I was seriously untatting size 60!! Jackie gave her a little flower and she made the typical comment that she couldn't do anything like that... 'I just like to enjoy myself' said she!! Why do people think that we don't enjoy ourselves!!! Before she got off the train she produced from her money purse a few bits of straw which she said came from the Christmas crib in the cathedral where she lived. She divided it up into three little bits and passed one each to Jackie and me and told us to keep it in our purses..'and then your purse will never be empty', she said. Now I would normally have ditched this at the first opportunity but it was such a sweet gesture that now I am stuck with two bits of straw in my purse!! Oh I forgot to tell you that on the Saturday night as well as the wonderful talk on Antique Lace.. the ladies of the Women's Institute came in and showed some of the wonderful things that they make and we had to show them and repeat all the tomfoolery till tears ran down their cheeks! 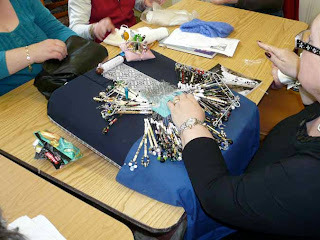 They were so impressed by my tatting and threads that they will be learning to tat too. Tatting certainly spread it's name that weekend, and so many little butterflies and cards were given away. 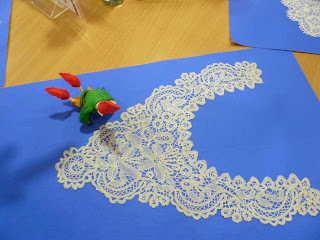 On Sunday morning we got our second chance to make lace. Fergeal has already reported what he learned but I guess I better repeat it here very briefly in case you don't follow Fergeal and his mates on their blog. 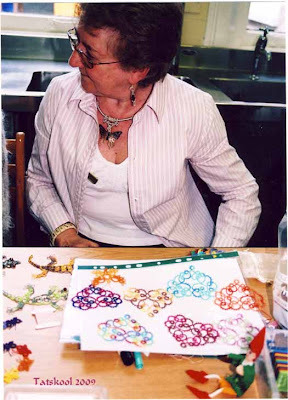 Carmel was making a butterfly in Youghal lace. 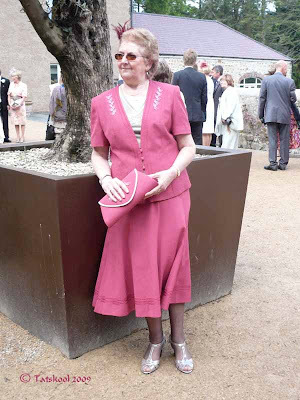 Of all the varieties of Irish lace that are known, Youghal lace is justly regarded as the most beautiful. It is at the same time the most difficult to make as it is worked stitch by stitch without any foundation. 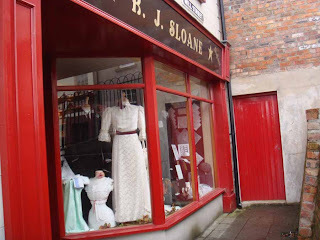 The Youghal lace industry had its birth in 1847, the Irish famine year. 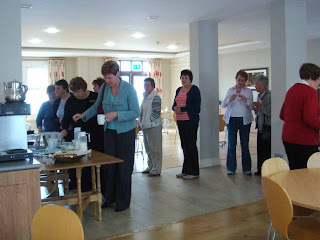 Mother Margret Smyth, a nun in the presentation, convent of County Cork, horror stricken at the sight of starting women and children around her, conceived the idea of starting some employment which might provide them with bread. But of what that employment should consist of perplexed mother Smyth. It so happens that one day, searching in out of the way nooks and corners, she chanced to light upon a scrap of rare old Italian lace. The moment of inspiration had come. Here was work which might yield bread for the poor hungry girls and children. 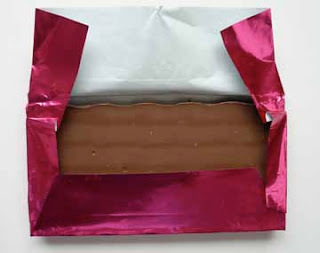 That lovely scrap should be made to give up the secret of its construction. Setting to work, she picked the lace to pieces, unraveling it unraveling the thread, until at last she fully grasped all the details of the delicate and intricate pattern. Mother Smiths difficulties were however, by no means at an end. Her self imposed task was an arduous one; but at last, after many attempts and repeated disappointments she succeeded in establishing a school for lace which is now of European reputation. It's a very difficult lace to make...I think as it has no foundation material to work on. That green stuff that you see does not become part of the lace. the stitches are worked on top of it. I have tried it and mmmmmm!! 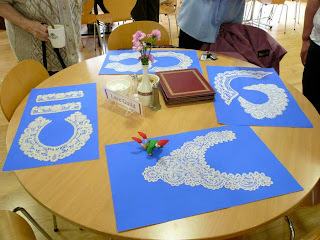 Jackie was doing Tambour Lace. 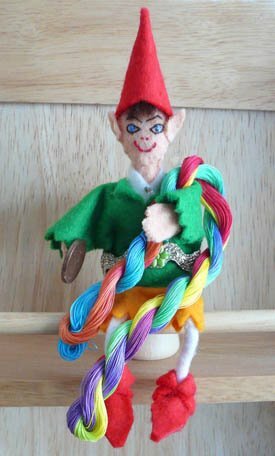 She uses a hook and very fine thread. Can you see the Swallowtail Butterfly that she is copying. 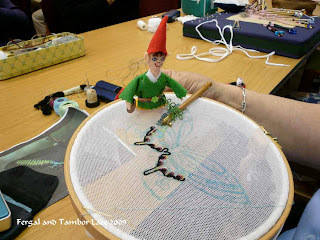 The net is stretched over a frame the Tambour like a drum and the hook draws the thread through the net to make a chain stitch. 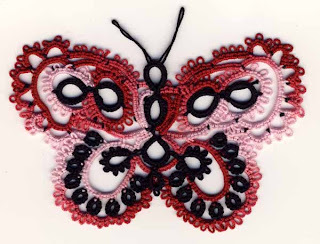 I didn't get very far with my Carrickmacross butterfly....too busy teaching tatting...and talking!! Jackie finished the butterfly from the pattern that I had taken to make. It's from the Bucilla Blue Book 317, adapted by Wally Sosa. The lady who had the Antique Lace brought in some more..this time bobbin lace. fergeal had a good look. She said that it was ok to show these pictures. While we were busy working we were offered a tour of the house so that stopped work!! 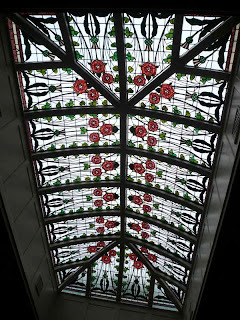 One of the things that I liked the most was all the stained glass by George Walton a contemporary of Renee Mackintosh. 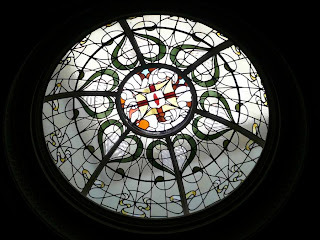 There was stained glass everywhere...the nuns had looked after the house so well that it was all intact. There was such an emphasis on letting in natural light. I wish I could show you it all. 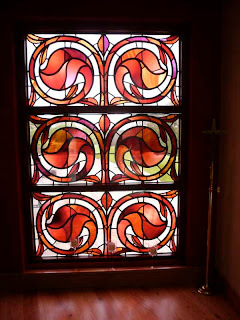 This window was repeated throughout the new extension and I guess is relatively modern, isn't it beautiful. 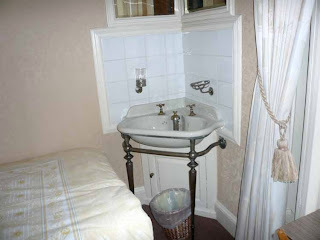 When the nuns bought the house in 1929 all that was left inside were three wash stands from 1873 which are still in fully working order in the bedrooms in the old house. 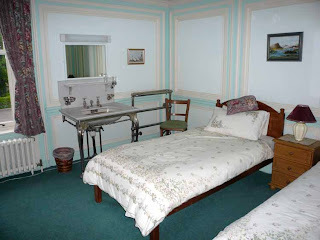 Our bedrooms with our fancy ensuite's were wonderful but Oh my these were so elegant. 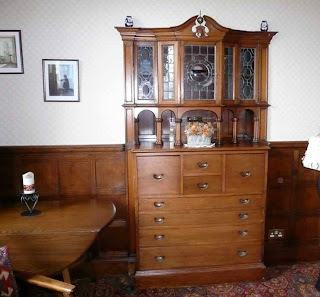 This piece of furniture also survived ..but only because it was built and recessed into the thick wall. The woodwork and William Morris wallpapers were stunning. Wish I could show you more, what a perfect peaceful place for a retreat.